Author(s): Md. Sameer Ahmed, Tahseen Kamal, Shahid A. Khan, Yasir Anwar, Muhammad T. Saeed, Abdullah Muhammad Asiri, Sher Bahadar Khan. Center of Excellence for Advanced Materials Research (CEAMR), King Abdulaziz University, P.O. Box 80203, Jeddah, Saudi Arabia 21589. Chitosan nanocomposite spheres (CS-NCsphere) and sheets (CS-NCsheet) were prepared by the simple embedding of Ni-Al in chitosan. The characterization of the samples was carried out by FE-SEM, EDS, XRD, and FTIR analysis. CSNCsphere and CS-NCsheet were applied for the removal of acridine orange (AO), cresyl blue (CB) and methyl orange (MO) from their aqueous solutions. All the nanocomposite samples, regardless of the shapes, were found to be good adsorption assisted photocatalyst for all the dyes as compared to virgin chitosan. Amongst the dyes, MO was selectively removed from the aqueous solution. Furthermore, the removal efficiency (R. E) for MO was higher on CS-NCsphere as compared to CS-NCsheet. 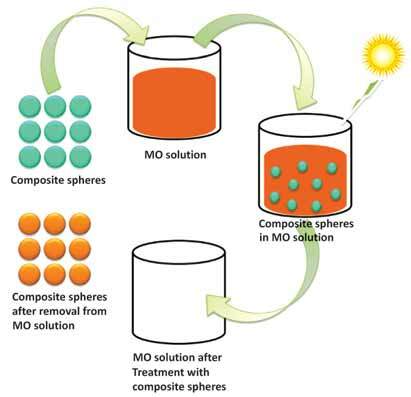 The CS-NCsphere showed good removal performance for MO dye in light as compared to dark, which suggests that CS-NCsphere eliminated it by adsorption assisted photodegradation. CS-NCsphere also displayed a significant antibacterial activity by inhibiting the growth of bacteria Micrococcus luteus. Thus, the fabricated CS-NCsphere can be used as bio sorbent in the future. Keywords: Antibacterial activity, bio sorbent, composite spheres, Micrococcus luteus, Ni-Al/chitosan. Affiliation:Center of Excellence for Advanced Materials Research (CEAMR), King Abdulaziz University, P.O. Box 80203, Jeddah, Saudi Arabia 21589. Keywords:Antibacterial activity, bio sorbent, composite spheres, Micrococcus luteus, Ni-Al/chitosan. Abstract:Chitosan nanocomposite spheres (CS-NCsphere) and sheets (CS-NCsheet) were prepared by the simple embedding of Ni-Al in chitosan. The characterization of the samples was carried out by FE-SEM, EDS, XRD, and FTIR analysis. CSNCsphere and CS-NCsheet were applied for the removal of acridine orange (AO), cresyl blue (CB) and methyl orange (MO) from their aqueous solutions. All the nanocomposite samples, regardless of the shapes, were found to be good adsorption assisted photocatalyst for all the dyes as compared to virgin chitosan. Amongst the dyes, MO was selectively removed from the aqueous solution. Furthermore, the removal efficiency (R. E) for MO was higher on CS-NCsphere as compared to CS-NCsheet. The CS-NCsphere showed good removal performance for MO dye in light as compared to dark, which suggests that CS-NCsphere eliminated it by adsorption assisted photodegradation. CS-NCsphere also displayed a significant antibacterial activity by inhibiting the growth of bacteria Micrococcus luteus. Thus, the fabricated CS-NCsphere can be used as bio sorbent in the future.